In a neoclassical perspective, goods and services are valued in a utilitarian framework, i.e., individuals are rational, have various categories of desires and wishes (e.g., food, housing clothes…), and are able to classify them according to their preferences. They aim at reaching a maximum level of individual welfare according to their income constraint (utility maximization under budget constraint). Moreover, individuals are able to value the impact of an additional unit of good on their own welfare, which is decreasing as the units aggregate (decreasing marginal utility law). In the end, the economic value of any good increases with its usefulness and scarcity. Markets generate the value of all traded goods and services as relative prices. Prices are therefore very useful in comparing different effects, as they give some indications of goods and services relative scarcity. It is assumed that values may be reflected in individuals’ willingness to pay (WTP) or willingness to accept (WTA) associated with a change in the availability or quality of the goods (see Table 1). The social value of goods is then the sum of the marginal utilities of each unit for all of its users. Economic values are classically divided into two types of values that make up the total economic value (TEV), in particular for environmental goods and services: use values, which include the benefits derived by an agent from a direct or an indirect use of the good or service at stake, and also a potential option value; nonuse values, which reflect ethical or altruistic preferences (see Fig. 1). When the market is distorted or when goods and services have no market, market prices are poor indicators of the true economic value. As a consequence, how can one assign a monetary value to changes of goods and services that are not intended to be traded in the market (e.g., health care, education, environment)? The conventional view would be that nonmarketed goods and services are priceless, and a purely market rationale would act as if they had no value, especially while considering externality mechanisms. To tackle this issue, economists have developed a variety of methods that allow the construction of monetary indicators to value loss or gain associated with changes in the availability or the quality of these goods or services (see section “Nonmarket Valuation Techniques”). In terms of law and economics, nonmarket valuation plays a crucial role to provide information to support public and private decisions in a cost-benefit analysis (CBA) perspective (Hanley and Barbier 2009), in particular regarding high probabilities of harm and environmental justice concerns (Hsu 2005). For the effects at stake to be co-measurable, they are usually monetarized. Nevertheless, we may note that as argued by Hanley and Spash (1993), this is merely a device of convenience rather than an implicit statement that only money is meaningful. Nonmarket valuation techniques are used to re-build individuals WTP/WTA towards changes in the availability or quality of nonmarketed goods and services (see Table 2). These techniques can be either direct or indirect. Direct methods are based on observable costs (avoided damage costs, replacement costs, opportunity costs) or allow deriving values from existing markets of close substitutes or inputs (production function). Indirect methods are based on individuals’ revealed preferences through a substitute market (hedonic pricing, travel cost method), on individuals’ stated preferences on an hypothetical market (contingent valuation, choice modeling), or on value transfer regarding nonmarkets goods and services from locations with similar characteristics (benefit transfer). By definition, each method has its flaws, as they either rely on individuals which may be misinformed, on proxies that may poorly represent agents’ behavior, or finally on markets in which prices are poor indicators of the economic value. Moreover, all presented methods are not indicated to assess all types of values. For instance, nonuse values can be exclusively assessed by stated preferences methods. Last, revealed preferences methods are indicated for ex-post analysis, while stated preferences methods are suitable for ex-ante analysis. Although nonmarket valuation plays a critical role to provide information to support decisions, this gives rise to conceptual and ethical issues especially with regards to environmental goods and services. 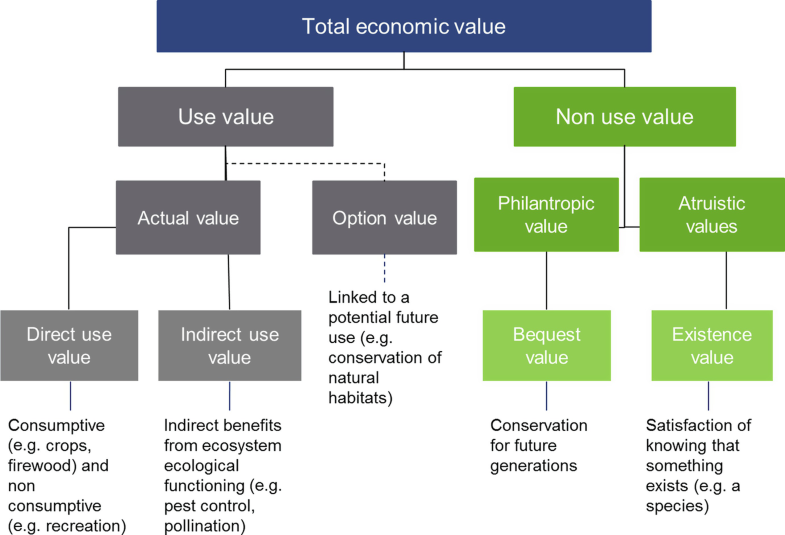 These issues lead to limits and criticisms with regards to, respectively, anthropocentrism, which is at the core of value building, and how heterogenous components of the total economic value (TEV) can be effectively aggregated; value discounting regarding future uses; and the spatial dimension of environmental goods and services valuation, including ecosystem services (Tardieu 2017; Roussel 2018). Furthermore, issues arise also in law and economics regarding how the information from nonmarket valuation can be used to value environmental damages and how suitable financial offsets can be defined. With regards to anthropocentrism, some limits do appear linked to possible confusion between an intrinsic value of nature, independent of humans, and the one derived from marginal changes linked to individual preferences. Moreover, there is also a reluctance to add benefits and costs without reference to their social distribution. In terms of values aggregation, one of the main difficulties is related to the heterogeneity of the methods used to derive these values (see section “Nonmarket Valuation Techniques”), which can be considered as not directly comparable. For example, the aggregation of use values measured by revealed preferences and nonuse values measured by stated preferences is relatively tricky. Connected to these issues arise technical difficulties as double-counting or the simultaneous economic valuation of uses that are socially or technically mutually exclusive (e.g., wood provisioning service and regulation service regarding carbon sequestration from forests ecosystems), as well as the degree of substitutability between so-called manufactured capital and of natural capital. If we now turn to value discounting regarding future uses, there is a choice uncertainty when taking time into account, particularly when we consider environmental issues with far-reaching consequences in the future. This has a twofold consequence on valuation (Chevassus-au-Louis et al. 2009): on the one hand, the costs and benefits linked to far-reaching consequences tend to see their weight in decisions reduced; on the other hand, there is an uncertainty on these consequences as well as the behavior and expectations of future generations. Accordingly, the selection of a discount rate can be justified following two main reasons: present preference and the decrease in marginal utility with higher incomes for future generations. Discounting can also be ethically criticized because discarding far-reaching consequences may lead to neglect critical issues with threshold (e.g., biodiversity). In addition, the spatial dimension has often been excluded from economic valuation, leading to results far removed from reality. For example, taking into account the spatial dimension of ecosystem services in environmental economics implies measuring these services (supply and demand) according to their spatial context. The ecosystem services supply is indeed influenced by spatial variables such as climate variables, topography, soil type, hydrological conditions (Nelson et al. 2009). Simultaneously, the ecosystem services demand changes depending on the location of the ecosystem providing this service as well as the location of the potential recipients, the number of substitutes, and the accessibility (Bateman et al. 2006). In brief, the value will be influenced by three variables: supply (quantity and quality), demand (number of beneficiaries, uses, socio-economic characteristics), and the spatial context (complementary or substitutes goods). Last, one can wonder about the reliability of the information from nonmarket valuation and how this can be used to value environmental damages and to define suitable financial offsets (Thompson 2002; Carson et al. 2003). The famous example of the Exxon Valdez oil spill in 1989 then led to nonuse value loss ranging from $2.8 billion to $7.19 billion (Carson et al. 2003), whereas use values loss were evaluated $5 million (Hausman et al. 1995). The ensuing debate with the Panel chaired by Kenneth Arrow and Robert Solow (Arrow et al. 1993) is thus an iconic illustration of controversies over the past decades and on-going debates on nonmarket valuation and Nature monetization (Gómez-Baggethun et al. 2010; Costanza et al. 2014).